I have just stumbled upon the latest article from Nirmal about a detailed procedure for finding the hex colour code of background. The procedure is a real elaborated effort on his part. But this can easily be done with the help of a small utility "Colour Cop" [Download here]. The screen cap shows two tools; eyedropper and a lens, which can be dragged to any part of your screen. 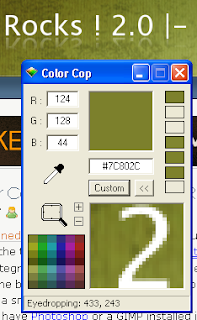 A zoomed image of the area around that tool can be viewed in the bottom square (preview pane) of color cop. The color of the central pixel of that preview pane is shown in the upper square along with the RGB as well as the hex code. If you want to change the hex code into RGB or vice-versa, simply type the value in the corresponding place. Isn't it simple. It is.